Carter has been having a really hard time at school. Not with the actual work. Not with socializing with other kids. Not with any of the learning components of education. But he is having a hard, hard time learning to focus. My boy’s got energy. And he likes to talk. And he doesn’t like to sit still. We made up a cheer that we’d say as he got out of the car before school. We talked about focus from sun-up ’til school each morning. And that was mildly successful. But I think, I think we may have finally found something that is going to work. 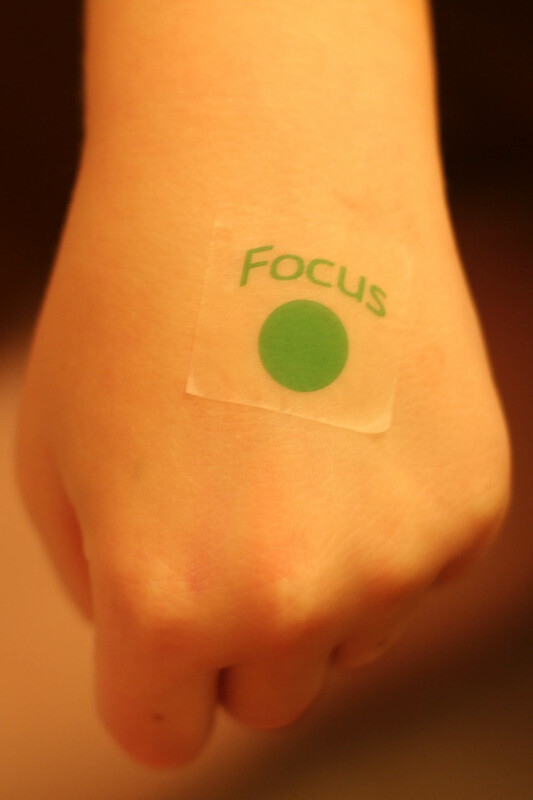 I bought some print-your-own-tattoo paper and made a “Focus Button” tattoo. His teacher said he got all his work done quickly and didn’t talk during work time! Here’s hoping Day Two of Project Focus Button works! What do you do to help your child pay attention? What a cute idea. Hope he has found his focus! Hope you’re doing good! It seriously makes me giggle. Brilliant, Brilliant idea! Love it. Brilliant, aside from the fact if Cody ever saw this he’d want to make a “multiply and replenish the earth” button for me. I’d never get anything done. I NEED one of these for my Wyatt. We are trying EVERYTHING for him and I wonder if this would help. Would you tell em how you made it and where you got the paper? Awesome idea! Hope it’s still working!